In the realm of electronics, polarity indicates whether a circuit component is symmetric or not. A non-polarized component -- a part without polarity -- can be connected in any direction and still function the way it's supposed to function. A symmetric component rarely has more than two terminals, and every terminal on the component is equivalent. You can connect a non-polarized component in any direction, and it'll function just the same. A polarized component -- a part with polarity -- can only be connected to a circuit in one direction. A polarized component might have two, twenty, or even two-hundred pins, and each one has a unique function and/or position. If a polarized component was connected to a circuit incorrectly, at best it won't work as intended. At worst, an incorrectly connected polarized component will smoke, spark, and be one very dead part. 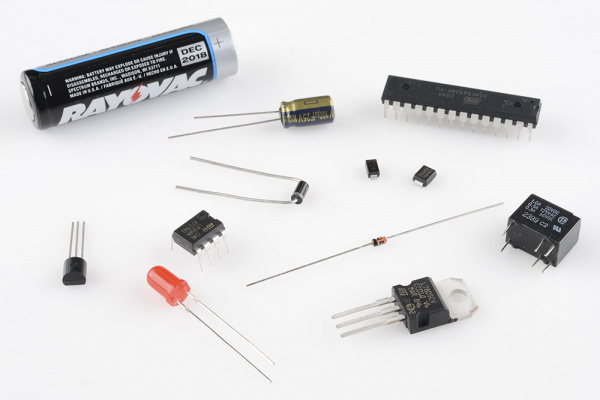 An assortment of polarized components: batteries, integrated circuits, transistors, voltage regulators, electrolytic capacitors, and diodes, among others. Polarity is a very important concept, especially when it comes to physically building circuits. Whether you're plugging parts into a breadboard, soldering them to a PCB, or sewing them into an e-textile project, it's critical to be able to identify polarized components and to connect them in the correct direction. So that's what we're here for! In this tutorial we'll discuss which components do and don't have polarity, how to identify component polarity, and how to test some components for polarity. If your head's not swimming yet, it's probably safe to read through the rest of this tutorial. Polarity is a concept which builds on some lower-level electronics concepts and reinforces a few others. If you haven't already, consider checking out some of the below tutorials, before you read through this one. Integrated circuits (ICs) might have eight pins or eighty pins, and each pin on an IC has a unique function and position. It's very important to keep polarity straight with ICs. There's a good chance they'll smoke, melt, and be ruined if connected incorrectly. Through-hole ICs usually come in a dual-inline package (DIP) -- two rows of pins, each spaced by 0.1" wide enough to straddle the center of a breadboard. DIP ICs usually have a notch to indicate which of the many pins is the first. If not a notch, the IC might have an etched dot in the casing near pin 1. An IC with both a dot and a notch to indicate polarity. Sometimes you get both, sometimes you only get one or the other. For all IC packages, pin numbers increase sequentially as you move counter-clockwise away from pin 1. 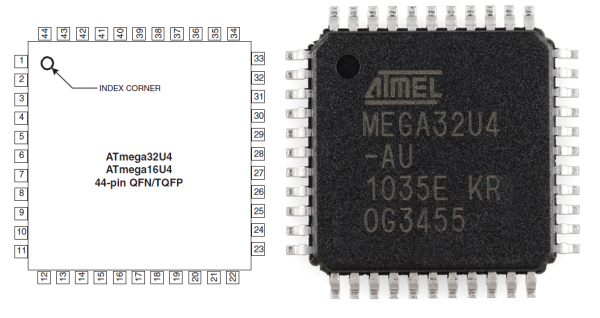 Surface-mount ICs might come in QFN, SOIC, SSOP, or a number of other form-factors. These ICs will usually have a dot near pin 1. An ATmega32U4 in a TQFP package, next to the datasheet pinout. Getting polarity right in your circuit all starts and ends with getting the power supply connected correctly. 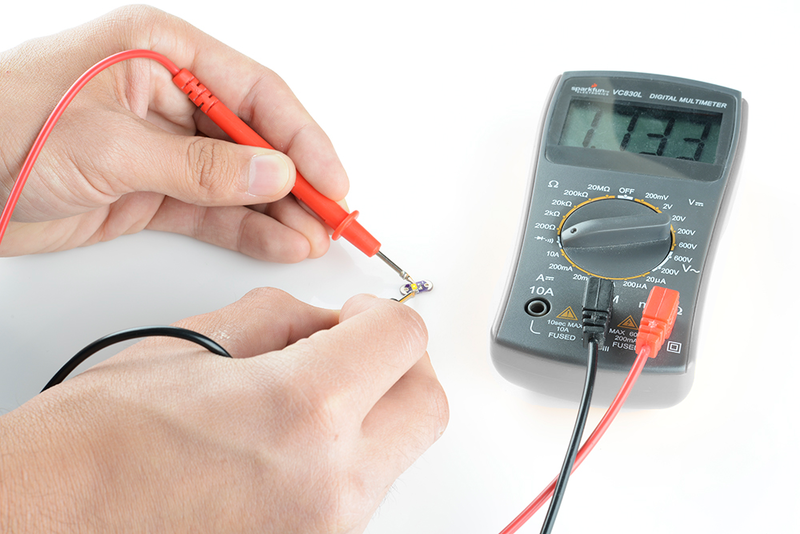 Whether you're project's getting power from a wall-wart or a LiPo battery, it's critical to make sure you don't accidently connect them backwards and apply -9V or -4.2V to your project accidently. Anyone that's ever replaced batteries knows how to find their polarity. Most batteries will indicate the positive and negative terminals with a "+" or "-" symbol. Other times it might be red wire for positive and a black wire for negative. An assortment of batteries. Lithium polymer, coin cell, 9V alkaline, AA alkaline, and AA NiMH. Each has some way to represent positive or negative terminals. Power supplies usually have a standardized connector, which should usually have polarity itself. A barrel jack, for example, has two conductors: outer and inner; the inner/center conductor is usually the positive terminal. Other connectors, like a JST, are keyed so you just can't connect them backwards. For extra protection against reversing power supply polarity, you can add reverse polarity protection using a diode, or a MOSFET. These (traditionally) three-terminal, polarized components are lumped together because they share similar package types. 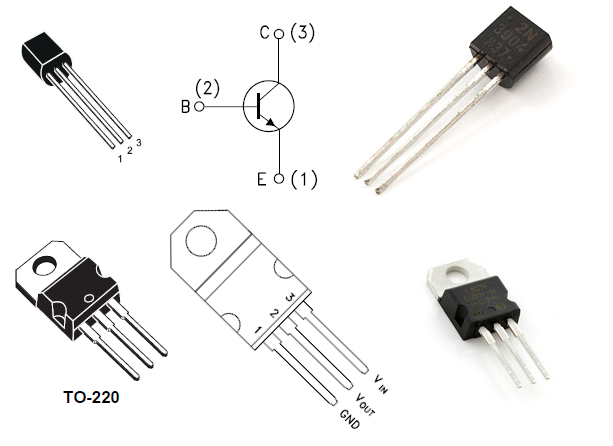 Through-hole transistors, MOSFETs, and voltage regulators commonly come in a TO-92 or TO-220 package, seen below. To find which pin is which, look for the flat edge on the TO-92 package or the metal heatsink on the TO-220, and match that up to the pin-out in the datasheet. Above, a 2N3904 transistor in a TO-92 package, note the curved and straight edges. 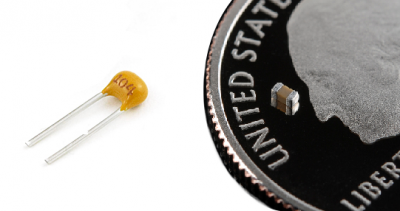 A 3.3V regulator in a TO-220 package, note the metal heatsink on the back. This is just the tip of the polarized-component iceberg. Even non-polarized components, like resistors, can come in polarized packages. 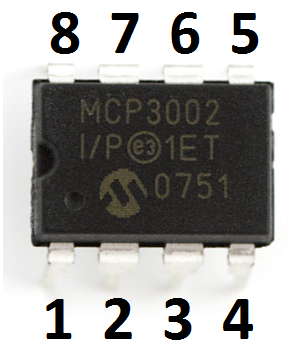 A resistor pack -- a grouping of five-or-so pre-arranged resistors -- is one such example. 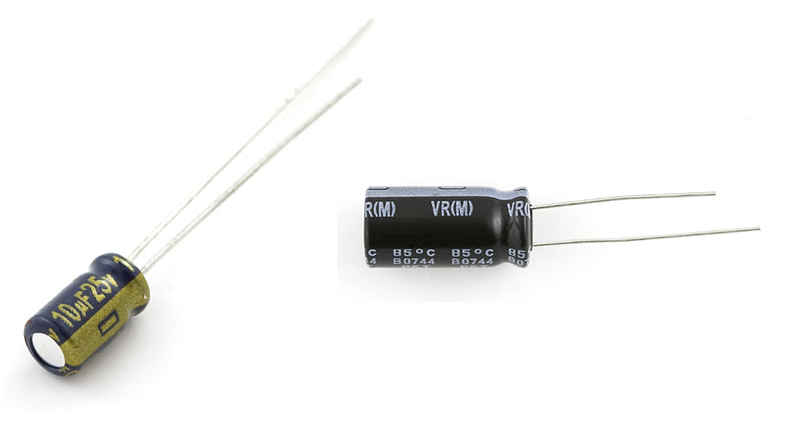 A polarized resistor pack. An array of five 330&ohm; resistors, all tied together at one end. The dot represents the first, common pin. Fortunately, every polarized component should have some way to inform you which pin is which. Be sure to always read the datasheets, and check the case for dots or other markers. Connector Basics - There are a number of connectors which have polarity of their own. Usually this is a great way to make sure you don't apply power or some other signal backwards. Diodes - Our shining example of component polarity. This tutorial goes further in-depth on how diodes work, and what types of diodes are out there. LilyPad Design Kit Experiment 1 - Circuits don't just exist on breadboards and circuit boards, you can sew them into shirts and other textiles too! Check out the LilyPad Design Kit tutorials to see how to get started. Knowing polarity will be huge in wiring up those LEDs correctly.